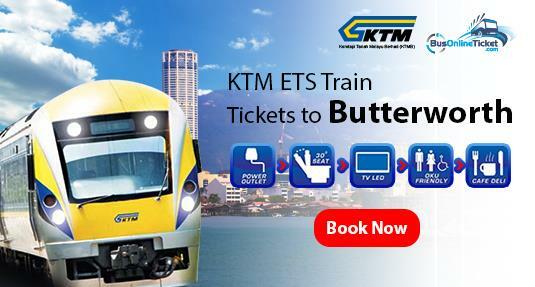 Despite having ways to go to Butterworth, many prefer to take ETS train to Butterworth due to many reasons. One of the best plus point of taking the train to Butterworth is the picturesque view from the window. Malaysia has many beautiful cities and the sceneries are rather fascinating even for just passing by. They reflect the harmony vibe of Asia. Apart from that, train tickets are cheaper than flight. Besides, ETS train is equipped with air-conditioning and comfortable seats. The journey should be a lot more comfortable than bus. The train speed is also much faster and there is no traffic on the train track to worry about especially during public holidays. You will surely enjoy your train trip in Malaysia. In short, the difference between these two is ETS Platinum has fewer stops compared to ETS Gold. The trip duration is almost the same. Butterworth is the transportation hub for express buses, train and ferry. The best part is, the station for these three public transportation is conveniently located near to each other. Visitors can reach these stations by walking through the covered walkways built to connect them. The ferry from the ferry terminal in Butterworth can also take you to Georgetown, Langkawi, and Medan.